That is, I held yarn in my right hand and “threw” the live yarn around the right needle to create my stitches. I would transfer my needles to my left hand, use my right hand to wrap the yarn around my right needle, and return the right needle to my right hand to knit the stitch. I had heard that if I swtiched to “Continental” knitting — I.e., holding the yarn in my left hand and “picking” the yarn with my right needle — it would be quicker. But I didn’t feel like learning a new technique, so I kept throwing. And then one day — by accident, really! — I started holding the yarn in my left hand instead. Almost immediately, I realized I was knitting quite a bit faster! Since then, I’ve never returned to throwing. I’m a devoted picker. Why Change the Way You Hold Your Yarn and Needles? I tell you this story to demonstrate that you could increase your knitting speed simply by changing the way you hold your yarn and needles. At the time I switched to Continental knitting, I thought there was Continental knitting and English knitting, and that was it. I had no idea there were other ways to hold your yarn and needles. That is, until several knitters told me in my survey that they really wished they could knit faster. I decided to find out if there were any other ways to increase your knitting speed besides switching to Continental style. As it turns out, there are 3 other ways! And some may be even easier for an English knitter to switch to than Continental. 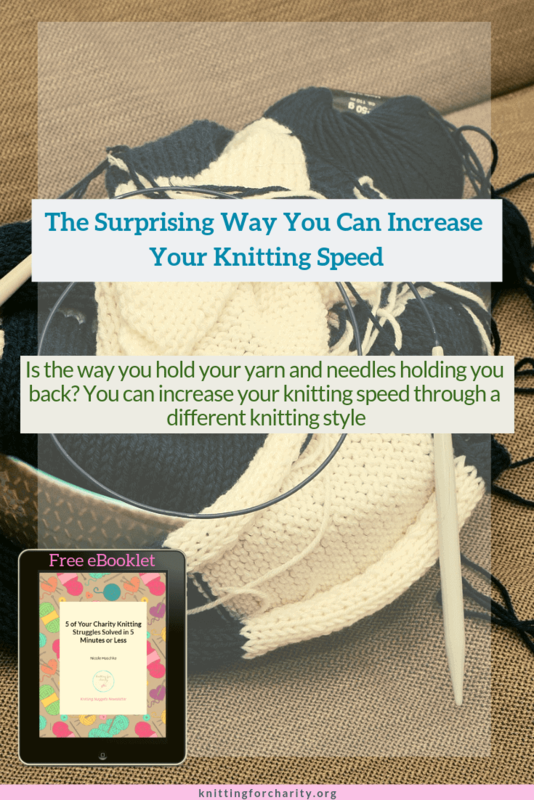 So if you’re an English knitter who would like to increase your knitting speed, read on! This fantastic video from Craft Sessions demonstrates every type of knitting style: English, Continental, Flicking, Irish Cottage/Lever/Peruvian, and Portuguese. If you’d like a basic overview of the various styles of knitting, you may find this video helpful. Sometimes referred to as “picking,” occasionally referred to as “German knitting,” Continental knitting is all about which hand holds and tensions the yarn. For every other kind of knitting, you’ll hold yarn with your right hand. In Continental, you hold it in your left hand. The speed factor of Continental knitting comes partially from never having to relinquish your hold on the needles. It also comes from the much smaller movement of your yarn and needles. For an introduction to Continental knitting (which might be all you need), check out this video from Two Stitch Knits. If you feel the need for more comprehensive instruction, I highly recommend *Bluprint’sKnit Faster with Continental Knitting class. This class is best for those who currently knit English-style and really want to get the hang of knitting Continental style for increased speed. *This is an affiliate link; if you make a purchase after clicking, I may receive a commission. Thanks for supporting Knitting for Charity! This style of knitting is almost identical to English style, or “throwing,” except that with this method, you don’t let go of the needle in order to wrap the yarn around the right-hand needle. Instead, you’ll “flick” the yarn around your right hand needle with one finger. This is a great way to knit faster if you’re an English knitter and don’t want to try to get used to holding the yarn in your left hand. Very Pink Knits has a terrific video where she demonstrates flicking. I don’t know of a flicking class like the Bluprint Continental class, but I don’t think it’s necessary. Flicking is really just a natural evolution of English knitting! In a way, Portuguese knitting is like purling every stitch in every other style of knitting. That is, in English, Continental, flicking, and lever knitting, you hold the yarn behind the work to knit and in front to purl. In Portuguese knitting, you always hold the yarn in front of the work. Sounds crazy, right? But in Portuguese knitting, it works — and often, it works a lot more quickly than in any of the preceding techniques! Want to see just how it works? Let’s go to Very Pink Knits once more and she’ll show you how to do it. I love this video because she shows you how to work each stitch very slowly, so you can see exactly what’s going on. Then she shows you what full-speed Portuguese knitting looks like. A *Bluprint class is available for Portuguese knitting, and you may find it helpful if you want to learn how to use this method for lace, cables, and/or colorwork. It’s hard for me to decide which knitting technique is funkier: Portuguese or lever knitting (I’m going to call it this because it’s shorter, but it’s identical to Irish Cottage/Peruvian). What makes this technique completely unique is the way you hold the right needle. The aim is to hold the right needle so that you’re not really moving it all. The movement of the stitches comes almost entirely from your left needle and the yarn in your right hand. You can hold the right needle in one of two ways. One way to hold it is like you would a pencil. The other way is to hold it under your arm. One huge benefit to this style of knitting, in addition to the potential for tremendous speed, is that it is ergonomically the best knitting method. Many knitters have reported that arm, hand, and/or wrist pain has disappeared entirely thanks to this method. This method really needs a class. Unfortunately I have not found any online classes for this technique. Tutorials and videos abound, but they’re not tremendously comprehensive. The following collection of links should help, but be prepared. You may need to experiment a bit to fully this master this technique. The following are links and videos demonstrating lever knitting. By the way, be careful if you attempt to find further tutorials or videos on “Peruvian” knitting. Many people confuse “Peruvian” with “Portuguese.” If you read about the use of a “knitting pin,” it’s Portuguese. Some Portuguese knitters use a knitting pin to hold the yarn in front of them instead of wrapping the yarn behind their necks. I hope this series of posts have helped you find encouragement and/or ways to knit faster. Which tip or technique did you find most interesting or useful? For more tips on knitting faster, check out the first part of this series, which includes expert tips on faster knitting! Thanks so much for assembling all these. As the link to: Sigrid Knits’ Lever Knitting post (containing 2 videos) is no longer working, do you know if it is archived somewhere? Hi, June! I didn’t know the post link was no longer working, thanks for letting me know. I’ll look into this and see if I can find a good link. If I can, I’ll revise the post (and I’ll post a comment to let you know). Thanks again! 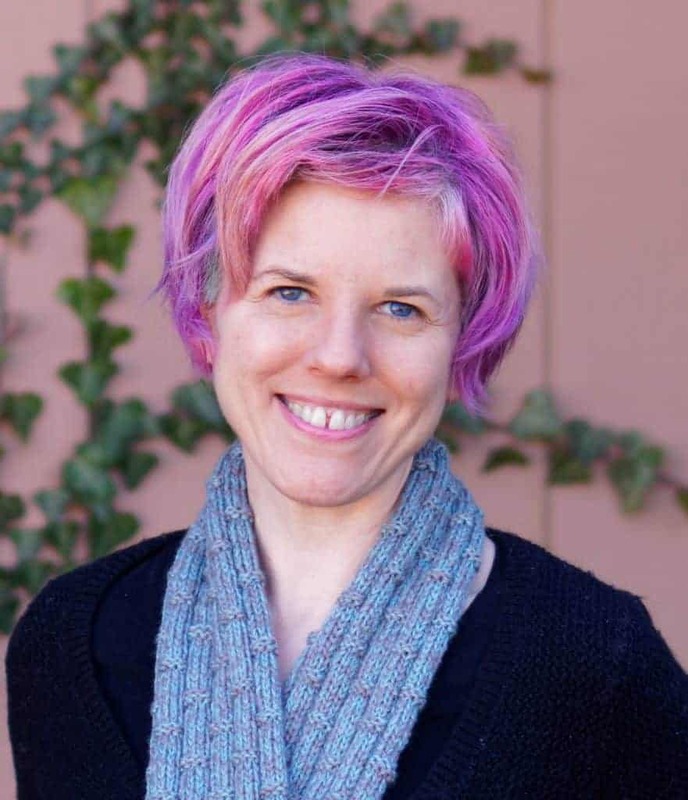 Unfortunately, though I did find an archived version of the Sigrid Knits blog post, that archived version didn’t have the videos linked, so I don’t know what those videos were. (I suspect the blog was taken down entirely due to copyright violations.) I did fix a link from the first A Thread of Mindfulness video, and I think her videos are probably the closest thing we’re going to get to a decent lever knitting tutorial. (I honestly can’t believe there’s no Bluprint class available for this!) Sorry I couldn’t be more help. Thank you so much for this all-inclusive video. I have quite serious arthritis in all my finger joints and especially at the base of both thumbs. I have come back to knitting after a break of 10 years, about 10 years ago, and I CANNOT give it up. Happily, both my rheumatologist and my physio (both women) have encouraged me to keep going, as the physical activity is very good for maintaining mobility in my finger joints. I am now waiting for the birth of my first (and maybe only) grandchild (a boy) after being told for a long time that there would be none!! Sooooo, my knitting fingers have been going ballistic!! Now I have found my wrists starting to protest, so I’ve resorted to wearing a combined wrist/thumb splint. It works quite well. My next experiment is to try the Continental method, that I actually saw being used for the first time only yesterday when refreshing my memory on I-cord making. I think it could be good for my poor hands. You’re very welcome, Aless! I’m so glad you found it helpful. Congratulations on your coming grandchild! I’m thrilled to find this page with links to the various videos all in one spot. I am one who definitely would like to learn to knit faster. Ive often lamented the fact that I didn’t learn to knit in the beginning in the continental style, as it seems those who do are much faster knitters than me (I’m a slow thrower). I’ve tried it, but it felt so awkward to me that I gave up, though it likely isn’t anymore awkward than my style of English knitting was to me when I first learned it. I have so many things I want to get knit that I’ve hesitated taking the time to learn and switch to a new technique, even though I know I’d get more knitting done in the long run. I only recently began to notice knitters doing the flicking in videos, and even watched a tutorial (Staci’s at Very Pink), but I got frustrated and gave up quickly. I am DETERMINED, though, that this is the year I’ll learn to be a faster knitter. I can’t imagine not wanting to knit faster. I do enjoy the meditative aspect of knitting, but I don’t think that would be less so if I were knitting faster. I’d just be producing more knitting!